“Do justice. Love kindness. Walk humbly,” says Micah, but what does that look like, in practical terms, today? This week? I have become convinced that real transformation happens in the context of relationships. If we want the people around us, and ourselves, to grow and change, we have to come to know each other across the lines that often separate us. I want to engage, and actively dismantle my own assumptions about people, and theirs about me. Real relationships tend to do that. Jesus answered by telling a story about a Samaritan, a member of one of the most reviled groups his listeners would have been able to think of (Jews were forbidden to even speak to Samaritans). This man is the hero of the story — not the victim — and Jesus ends the story with “Go and do likewise.” Go be like this Samaritan. It’s hard to imagine how offensive that idea would have been to his listeners. But it wasn’t uncommon for Jesus to be quite confronting in terms of his unwillingness to respect the lines that separated people from each other in his own time and context. He hung out with women, and with people who were considered unclean. He stopped the folks who were trying to get the children to go away. He invited himself to dinner with a wealthy tax collector who made his fortune milking poor folks. There are many more examples. Usually, a few seconds after I say those words out loud, I remember that I am somebody. So maybe I’m the one who should do that. On Christmas Eve, my eight-year-old son Mason helped me nail a large banner to the siding on the front of our house. I had written the text, and hired some designers I work with to make it pretty, and my local print shop printed it for me. Big. Three feet by eight feet. Then, a few days later, I put a picture of the sign on Facebook. Maybe what has happened since counts as “going viral.” If not, it’s at least a pretty nasty head cold. A week after I posted it, 135,926 people had seen it on Facebook alone. The message is not “let’s just play nice and pretend everything is fine.” Things are not fine. A lot of people are in real trouble and at real risk. Rather, it’s an acknowledgement that if our goal is to move our nation in a better direction, our best bet is to actually know each other, to develop the relationships that lead to hearing each other’s hope, pain, history, and fear. That’s where real transformation happens, not in being shouted down or ostracized. We are seldom rejected into changing. Politics isn’t football, where hurting the other side is how we win. It’s more like marriage, where hurting the other side hurts us all. The way forward is not through defeating our opponents, it’s through transformation. It’s through (dare I say it?) 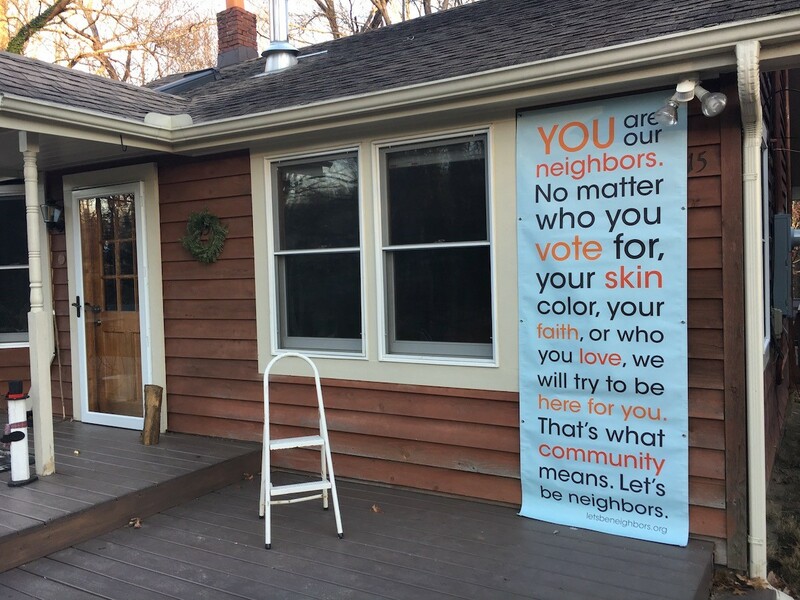 loving our neighbors. 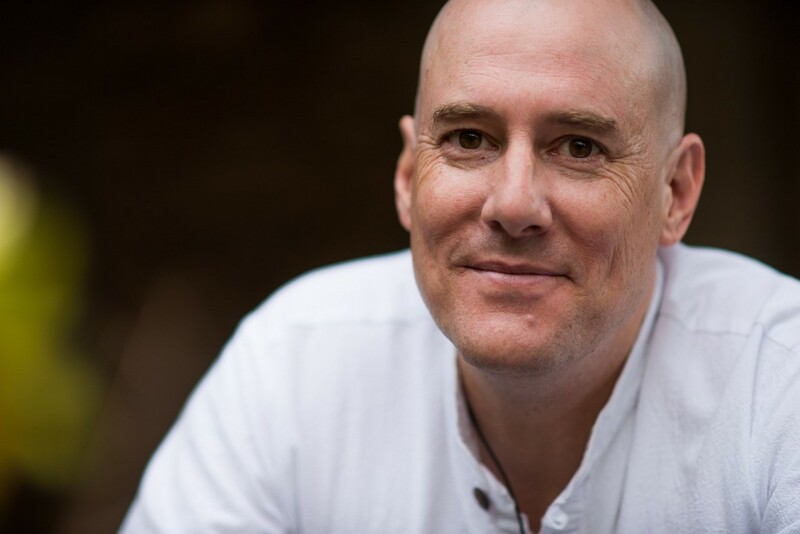 David LaMotte is a singer/songwriter, author, speaker, and retreat leader. He lives in Black Mountain, NC with his wife, son, and eight backyard chickens. His most recent CD is The Other Way Around, and his most recent book is Worldchanging 101: Challenging the Myth of Powerlessness. A church study guide for Worldchanging 101 is due out this year. More at davidlamotte.com. Want your own version of the sign? David has made them available here.